NovaMind Pro is an excellent product for advanced Mind Mappers, senior school and university students, coaches, and for general business use. 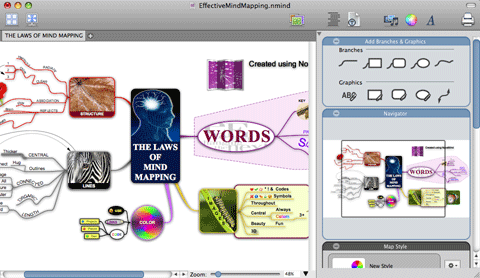 With NovaMind Pro, you can edit multiple Mind Maps in a single document, with hyperlinks between the documents. It has an advanced outline view with the branch notes on the same panel for those who like to work extensively with the outline view. There are power editing features like drag and drop hyperlink addition, branch checkboxes and the ability to take a branch and create a new Mind Map from that branch, or to make a new Mind Map from an existing one. There are a number more export options in NovaMind Pro, including the ability to create your own templates for new Mind Maps.